Finnish power metal band Stratovarius are due to release their new studio album, Nemesis, in late February. Fans though can get a taste of the new album with the new EP, Unbreakable, which is being released on 25th January. The EP consists of five tracks - one new song (Unbreakable) taken from the forthcoming album, Nemesis, plus four songs from earlier albums that have been remastered for this release. Effectively then it's the first single from the new album, but the presence of four remastered tracks makes it far more appealing than a typical single. Starting with the new song - Unbreakable, it opens with some nice keyboards, the guitars and drums quickly kick in, followed soon after by the vocals. It sounds fantastic - the vocals are great, there's plenty of power from the guitars and drums, and the keyboards and samples add a lot to it - a great song. 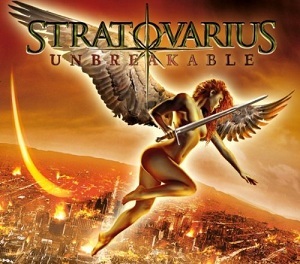 The other four tracks aren't new songs but they do all sound great here - these remastered versions sound superb, but then again that's what we've come to expect from Stratovarius. If "Unbreakable" is typical of what we can expect from the new album then I really can't wait to hear the album.